Do you have several different types of buyers who purchase your products? Confused about how to best capture leads from such varying audiences? In this case study, we’ll learn how SnackNation adds 1200 segmented leads to its list every week using OptinMonster. 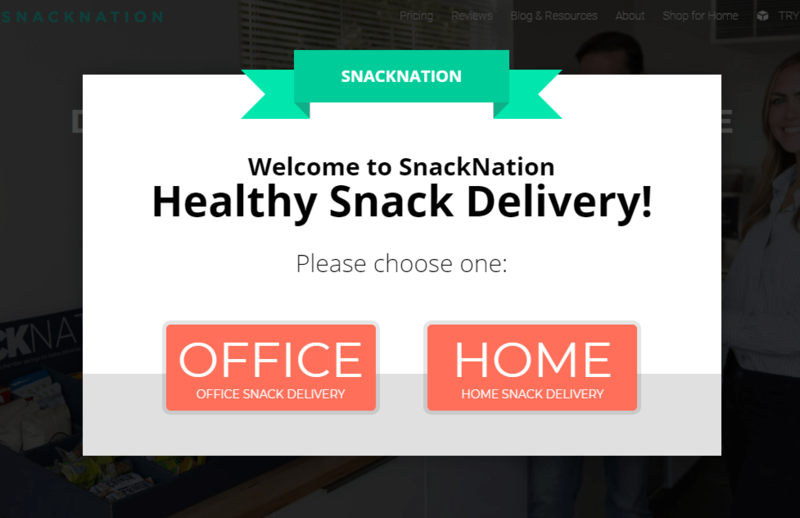 SnackNation is a subscription service, delivering healthy home snacks for home and office. SnackNation’s goal was to convert existing blog traffic to leads. Before using OptinMonster, their lead generation attempts were simply not productive. They needed more control over the placement and triggers of their optins in order to segment users effectively, so they decided to give OptinMonster a try. OptinMonster offers many types of optins, and SnackNation uses all of them. Here are just a few examples of how they’re using OptinMonster on their website to turn visitors into leads. Content upgrades are valuable pieces of information offered in exchange for a visitor’s email address. Unlike generic, site-wide lead magnets, content upgrades are specific to the content of the page or post your visitor is already reading. 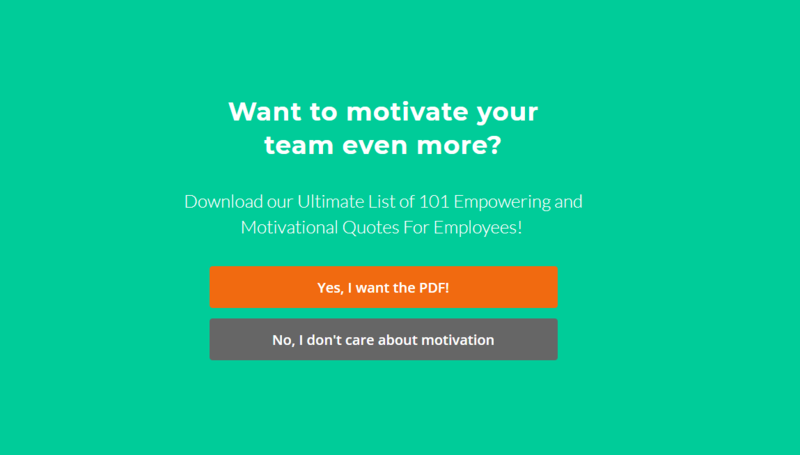 For the article 101 Inspirational and Motivational Quotes for Work , SnackNation offered the entire list of 101 motivational quotes, compiled into one PDF. They shared the offer using an OptinMonster MonsterLink. MonsterLinks trigger a lightbox optin with the click of a button, text or image. When a visitor clicks the text, “Download this entire list as a PDF,” an optin appears containing a subscription form. The 101 Quotes PDF is then delivered to converted subscribers on the confirmation page, and via an email. This MonsterLink converts 56.97% of readers who click the link. 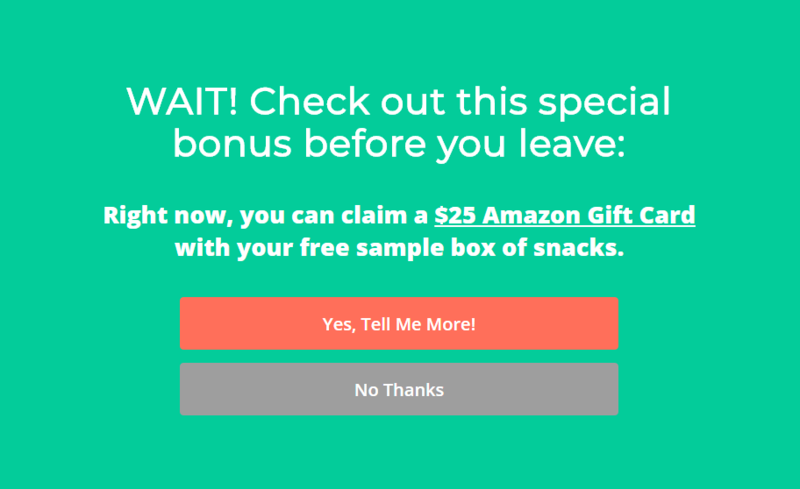 SnackNation went one step further, adding the same offer in a fullscreen optin with Exit-Intent enabled. Exit-Intent triggers an optin only when the visitor’s mouse motions towards the browser bar, an indication they’re about to leave the website for good. Since the visitor is about to leave anyway, it’s a great time to make one last enticing offer. This optin converts 3.53% of abandoning visitors. This optin uses our Yes/No feature to replace the traditional optin form with two buttons. Each button can either redirect to a new URL, launch an optin form, or simply close the optin. Clicking “Yes, Tell Me More” redirect the visitor to a landing page, where they can register for a free trial to claim their $25 gift card. Clicking “No Thanks” simply closes the optin. According to the Zeigarnik effect, once a person begins an action they naturally want to see it to completion. A visitor who starts the action by clicking yes is more likely to request the free trial than one who only saw the optin form itself. The optin utilizes a giveaway to add value to the free trial. Who doesn’t love Amazon giftcards! Other OptinMonster customers have seen huge success increasing conversions using giveaways, too. Perhaps the most powerful way SnackNation uses OptinMonster happens as soon as you land on their website. On every page of their website, immediately after arriving, you’ll see this Lightbox optin using the same Yes/No feature mentioned above. SnackNation segments their users immediately into two groups: those who are ordering for an office, and those ordering for their home. The “OFFICE” button simply closes the optin. 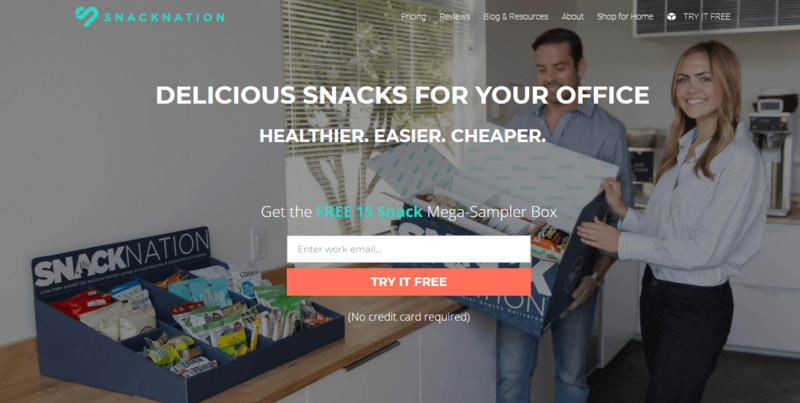 The “HOME” button redirects visitors directly to SnackNation’s subscription service. 39.60% of visitors choose the Office button. Since the decision making process for each segment is quite different, it makes sense to help people move quickly towards the one that fits them best. Office buyers are encouraged to book a sales call to receive their free trial, while home buyers can purchase a subscription directly. In reality, Office buyers can buy directly from the website, too! However, SnackNation knows they’re more likely to close an Office sale when they first have a chance to speak with the decision maker. A very smart tactic, indeed, and one you could implement in your own business. Segmenting your visitors can be done in many ways, but is vitally important. Content Upgrades can help segment by interest, while Yes/No buttons can allow visitors to segment themselves. Either way, be sure you’re segmenting your list to increase sales. OptinMonster has also helped us grow our email list tremendously. We’re adding over 1,200 new emails to our list each week.